“Obviously, the conflict made us suffer a lot but neither I left this artwork nor I will. No matter what situations I have to face, I won’t leave it,” said Saleem Qasba, who left his job in a multinational company in Dubai, and came back to Kashmir to preserve the 150-year-old family art business. A resident of Downtown Srinagar, 38-year-old Mr. Qasba walked back home, not only to preserve the legacy of his forefathers but for his childhood passion as well. Despite a decent salary, company sponsored perks, and a luxurious life in Dubai, his passion drove him back to Kashmir to continue the art of walnut furniture. “I am contented as my goal is to satisfy the customers, I can bear loss but not the dissatisfaction of my customers,” said Mr. Qasba, and admitted his ambition to compete with the Chinese products in the market. In order to achieve that, he has started to market walnut furniture through products like bedroom sets, dining table, writing desk, and gift items. Though, the path was full of hiccups in the Downtown. Due to the availability of all procurement, the trade was closely associated with Shahr-e-Khas. His father and uncle inherited this business from their forefathers. The prime customers used to be from Japan, Germany, and London, but the conflict has made them suffer a lot. Even the elite Indian customers are finding it hard to make their way to Kashmir. Though they still have some clients left, the volume has gone downhill. Now, he travels to middle-east countries to develop contacts in order to boost his trade. 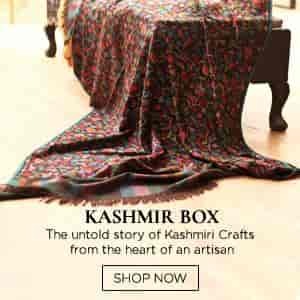 The business started with handicraft items of Kashmir like Pashmina, Crewel, and shawls. With the subsequent evolution around the trade art, the family introduced walnut furniture. Feeling proud of his father, Mr. Qasba said that all the ambassadors and diplomats used to be their clients. Now, he is determined not only to continue his passion but also to make the art flourish around the world. Recent taxation laws have only made it worse for artists like Mr. Qasba to breathe. Unlike earlier, now they got to pay 28 percent GST to the walnut furniture items instead of 13.5 percent VAT. Making the efforts to market quality products at competitive prices, the focus has now shifted mainly to cater Kashmir; to give it’s people the best.